Step 1: Design, build, and program a robot that can compete as a sumo bot. our robot large so it's hard to be pushed or flipped. In our first prototype we did not have a very sturdy base structure, which would be our first concern. The motors coming off of the NXT robot from the immediate front made it so this could also come apart easily as well. This was definitely not good for a robot supposed to be used as a "sumo bot". We also still needed to add things to this design. A better gear ratio would help, preferably one that wouldn't keep slipping, as well as a shield in front to push away and block other attacking robots. Our next design, I believe, was more sturdy than our first. We felt that making a more compact robot would help, so we connected the motors and wheels to the underneath of our NXT robot. We still needed to work on our gear ratio and design (so as not to keep slipping), and want to add a swivel wheel to the back. We did add the shield that we had wanted, as well as the sonic sensor. We also moved our light sensor to a better accessible location. Our final prototype design was able to move the best out of all of them. Instead of our idea of a swivel wheel, we decided to add a building piece in our kit that would easily be able to slide, instead of possibly get stuck like a swivel wheel would. We took away the sonic sensor and light sensor because of the new requirements of using a remote control instead of a program. Also, our gear ratio didn't keep getting stuck like in our previous robots and our wheels didn't turn out. For our program our bot will wait for five seconds before starting, then proceed forward. The bot will go forward until it sees the black line ("wait for dark"). Then the bot will move backwards for two seconds, followed by a turn for five seconds. This process will then be infinitely looped back to the beginning (after the five second time wait). During this design challenge, we learned many different things that can now help us for the rest of the year. Throughout the many different trials for our sumo bot structure, we found out which strategies work the best. We found out that attaching just a simple sliding peice to the back helps the robot move, other than attaching an actual wheel, even a swivel wheel. We also learned how to attach the front wheels better, so they would not push apart when moving, like in one of out designs. 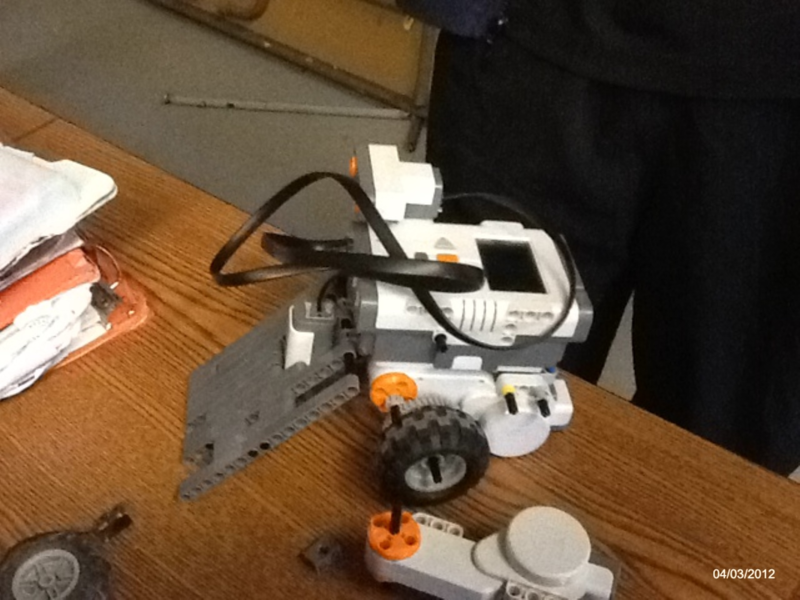 Lastly, we found out how to connect and use the remote control for our robot. Something that we would probably change if we had the chance to do this design challenge again, would probably be the robot's structure. Even though we did come a long way in making our design better, it still could use some work. I would have liked if we could make our final robot even more compact, a better (stronger) gear ratio, and found a place that we could have added on more weight. With these changes, we might have been able to win against out opponent, and not just tied. Click for our Sumo Bot video!